Are you traveling to Quesnel in a group or with a sports team? Touring the city with a few friends or on a couples retreat? 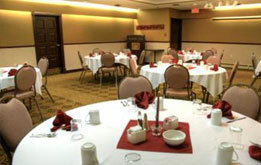 Whatever the case is, we cater to groups and have larger spacious rooms, and ample meeting and banquet space. Our Board Room features a large oval table and can comfortably accommodate up to 15 people. Our elegant Banquet Room can accommodate 100 guests and is the perfect space for your next gathering. If you require catering for your event, our very own Begbie’s Bar & Bistro can customize a menu specific to your requirements. Talk to one of our friendly front desk or reservation staff members when you call and ask about how we can assist you in organizing your group hotel stay in Quesnel, BC.